Sushi and avocados are two of my favorite foods. So what do you get if you mix these things together? 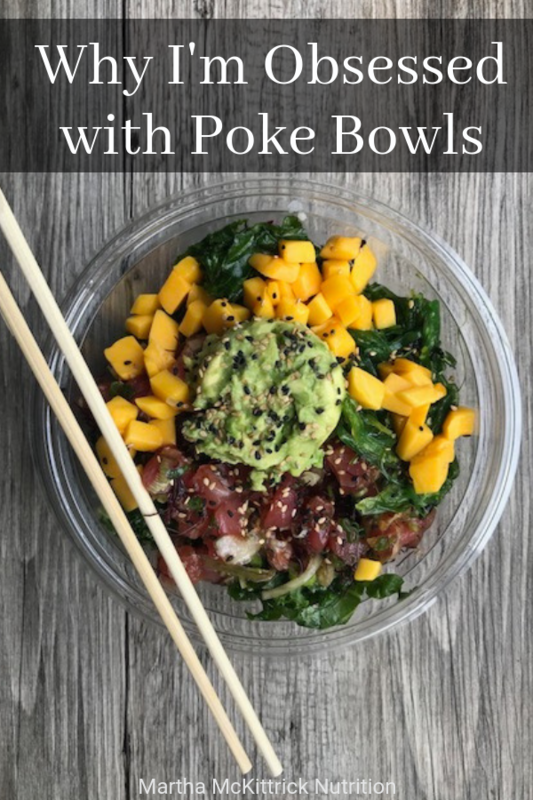 A poke bowl! Bowls containing protein, grains, vegetables and a light sauce have been a hot trend for the past few years. But the poke bowl has hit NYC full force! If you’re looking for a healthy lunch that’s not the same old salad or sandwich, look no further. 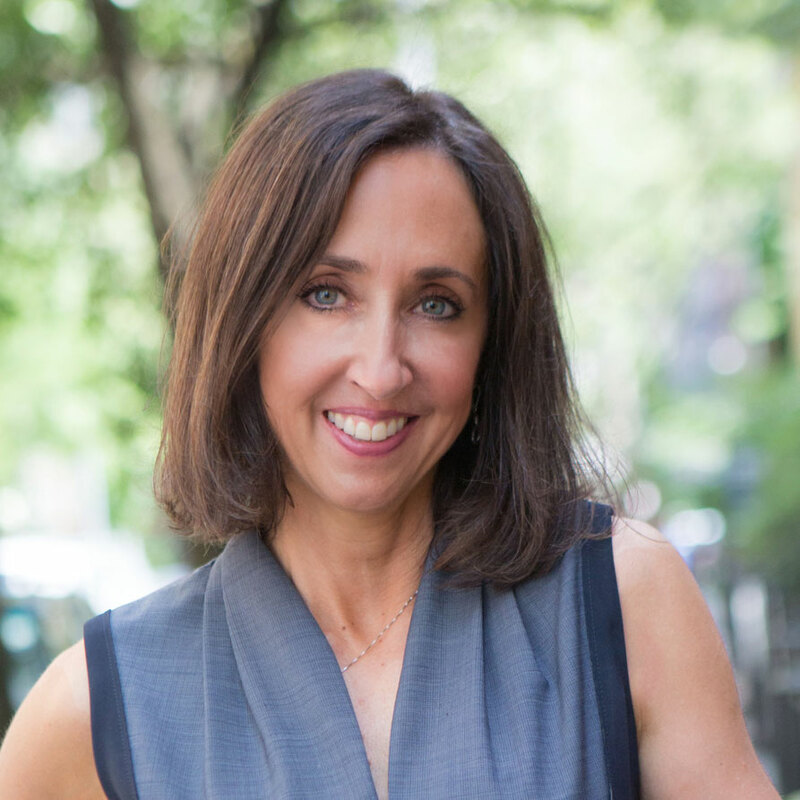 So you may be wondering like I was – are they actually healthy? 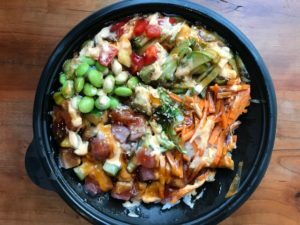 How many calories are in poke bowls? So I went on a poke bowl tour this week. I put on my detective hat and checked out several local spots … and then brought them home to dissect them for portions/calories in the privacy of my home! First of all, make sure you pronounce it correctly – “poh-kay”. 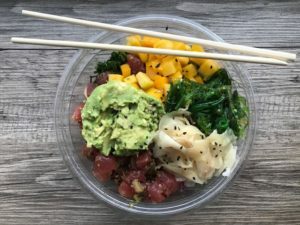 Poke is a classic Hawaiian dish featuring marinating raw fish in soy sauce and sesame oil, and mixing with rice, vegetables, toppings and sauces. Depending on what you add to it, it can be really healthy or loaded with calories, fat and carbs. -Pick your base: pick your base. Usually it’s rice or greens. Or you start with rice and then add greens on top. Some places have bases of cauliflower rice and zucchini noodles! 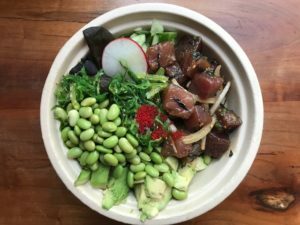 –Pick your poke: choices include raw tuna, salmon, octopus, and cooked tofu. These choices tend to be marinated and in a light sauce. Some places will also serve plain raw fish if you ask. 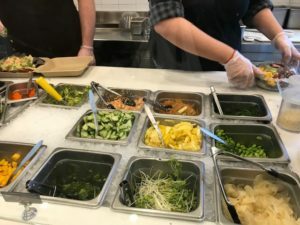 –Pick your toppings: depending on where you go, choices include edamame, kelp noodles, crab salad, seaweed salad, daikon sprouts, pickled ginger, mango, avocado, masago roe, nori, pineapple, etc. -Sauce: in my opinion, you really don’t need a sauce as several of the ingredients are marinated already. But you can get a spicy mayo sauce, soy sauce or hot sesame oil/soy sauce combo. These bowls come already prepared so basically you take it as is. It contains rice (1 cup), poke tuna (4 oz), avocado (2 oz), mango (1/3 cup) , seaweed salad (1/4 cup), ginger. I estimate it to be 525 calories and 50 gm carbs. What I liked: easy, quick, grab and go. It’s near my office too. There is minimal sauce on the tuna – which I like. But it’s almost too plain. What I didn’t like: you can’t build your own bowl. This is a small place in midtown east that sells an array of sushi, sashimi, dumplings and poke bowls pre-packed and ready to take out for a quick meal. 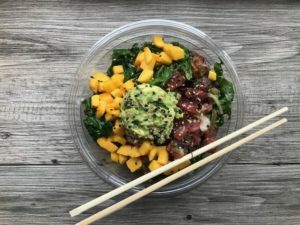 You can also build your own poke bowl and choose your ingredients. My pre-made bowl contained rice (1 cup rice), tuna poke (2 oz), edamame (1/4 cup), carrots, cucumbers, and 1-2 T. spicy sauce and some kind of glaze. I wasn’t able to calculate the calories as everything go mushed around with the mayo sauce! Maybe 575 calories? What I liked: sushi chef onsite with tons of choices for pre-made sushi pieces, rolls, etc. Grab and go. If I had more time, I would have build my own poke bowl. What I didn’t like: I grabbed a pre-made tuna poke bowl – but didn’t look too closely at what was in it. I hate mayo and it had quite a bit of the spicy mayo drizzled over the bowl. It also was a bit on the chintzy side with tuna – only about 2 ounces in the pre-made bowl. It also had some kind of a glaze on it. Overall too saucy for me. I made the trek to 38th Street because I wanted to try the cauliflower rice in the bowl. Kinda of a funny menu. It’s all poke bowls but also has hot dogs, fries and milkshakes! Kind of random …. My bowl contained cauliflower rice (3/4 cup), tuna poke (4.5 oz), edamame (1/2 cup), avocado (1.3 oz), seaweed salad (1/4 cup), salad (1/2 cup). I estimate it to be 455 calories and less than 20 gm carbs. What I liked: love the cauliflower rice option! What I did not like: The tuna looked a little grey – but it tasted fine. 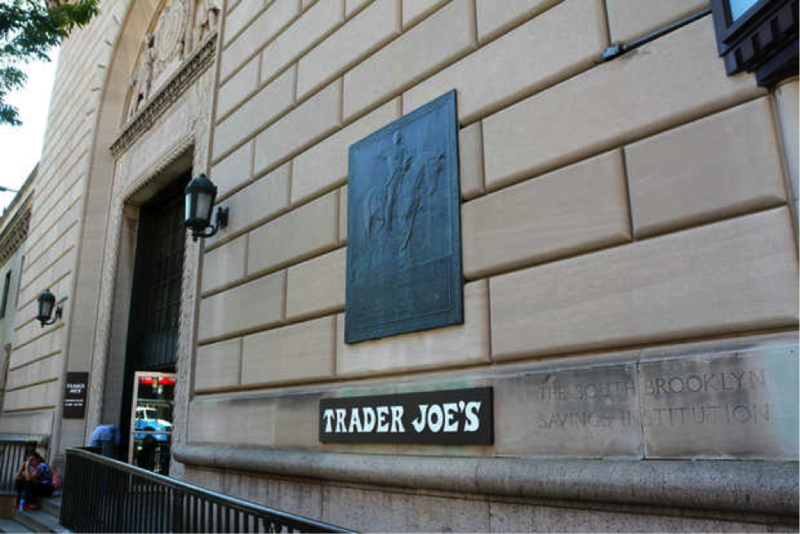 There are several locations in NYC. My bowl had brown rice (1 cup), chopped kale that had a little dressing on it (1 cup), tuna poke (4 oz), mango (1/3 cup), avocado (2 oz), edamame (1/4 cup), seaweed salad (1/4 cup). I estimate it to be 725 calories and 60 gm carbs. What I liked: the wide variety of toppings. What I didn’t like: I ate too much! Did not need all that rice. While this isn’t a “slimming” tip, it is my #1 tip – find a reputable place. After all, you are eating raw fish. Go to a place that’s busy and has a good reputation. No one wants to get slim by vomiting and/or having diarrhea from food poisoning. Limit/avoid the mayo spicy sauce. It’s one thing to get a little mixed into a spicy tuna roll, but the calories and fat can really add up if they are drizzling it over your bowl like salad dressing. If you love spicy mayo, get it on the side and use no more than 2 teaspoons. You probably don’t even need a sauce. The poke is marinated in soy sauce and sesame oil so it actually comes in a sauce. If you’re trying to lose weight or cut carbs, ask for ½ portion of rice and 1/2 portion of greens. The amount I got at every place was about one cup (~ 250 calories, 45 gm carbs). Or try to find a place with cauliflower rice or zucchini noodle to cut even more carbs. Or get all greens and no rice. 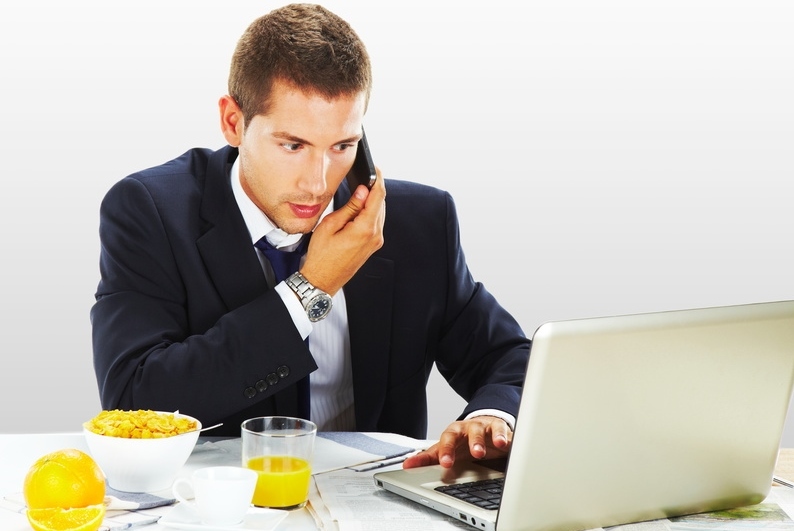 Look at the menu ahead of time if you are a newbie, especially if you’ll be going during prime time lunch hours as you’ll feel a little pressure on ordering.